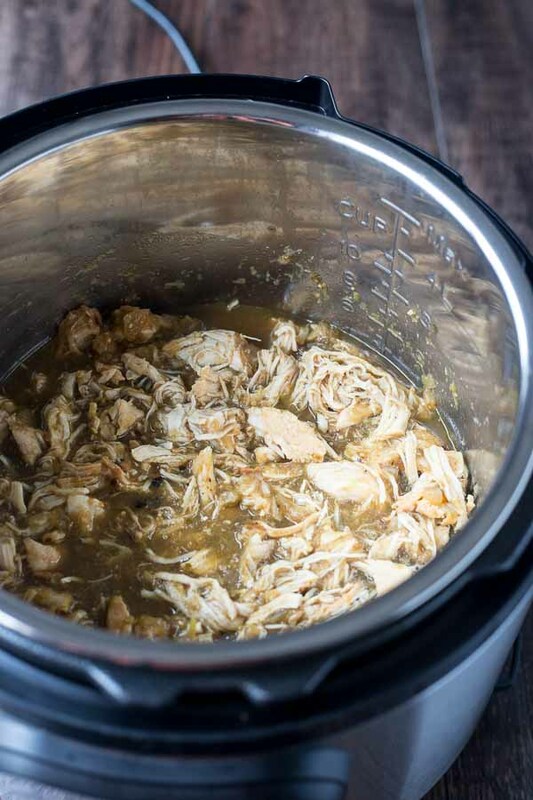 Instant Pot Chicken Chili is a delicious green chili (chile verde) conveniently made in the Instant Pot with only a few ingredients. You’ll have a healthy meal ready in no time with this recipe! You’ve probably heard of the Instant Pot by this point. It is pretty much the kitchen appliance to own right now and for good reason. It’s convenient, easy to use, and produces tasty meals. What’s not to love? 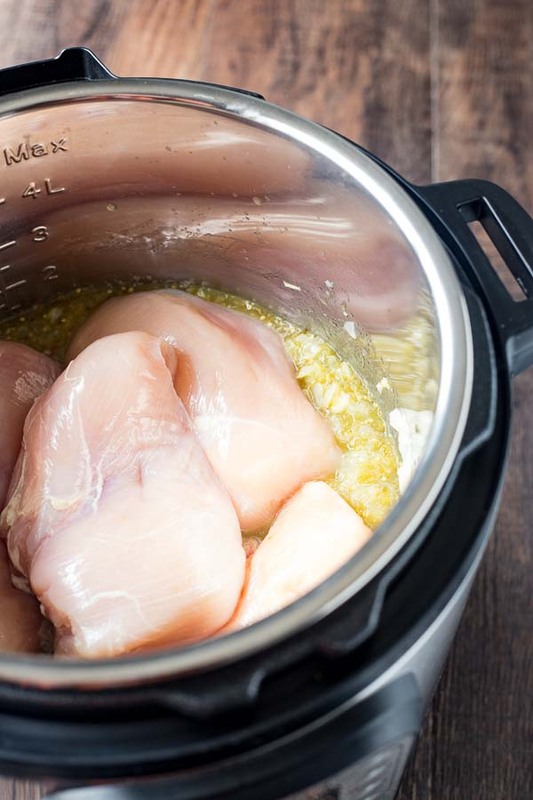 If you haven’t heard of the Instant Pot, let me introduce you to it. The Instant Pot is an electric, programmable pressure cooker with a bunch of settings that allow you to easily make a variety of dishes. 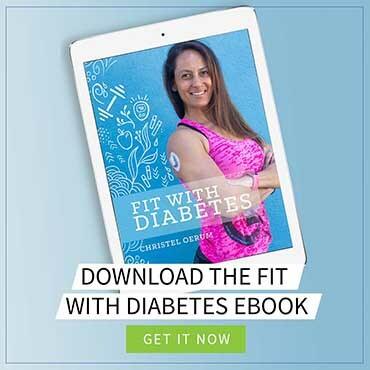 You can make your fair share of not-so-healthy food in it (I hear it makes a killer cheesecake! ), but it also makes cooking healthy dishes a breeze. Like this Instant Pot Chicken Chili recipe. All you have to do is sauté the garlic and onions (you can do that in the Instant Pot on the sauté setting), dump in the rest of your ingredients, set the timer for 10 minutes, and then let the Instant Pot work its magic. When the timer goes off, you’ll wait for the pressure to release naturally (about 8 to 10 minutes). 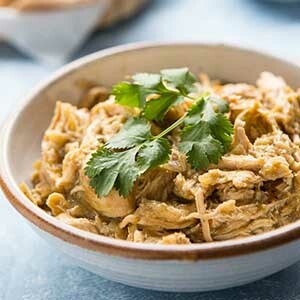 After the pressure has come down, you remove the chicken, shred it with a fork, then return it to the pot and combine it with the rest of the ingredients. Your Instant Pot Chicken Chili is ready to serve! It doesn’t get much easier than that. Meal #1: Serve it as-is for a wonderful bowl of satisfying chili. 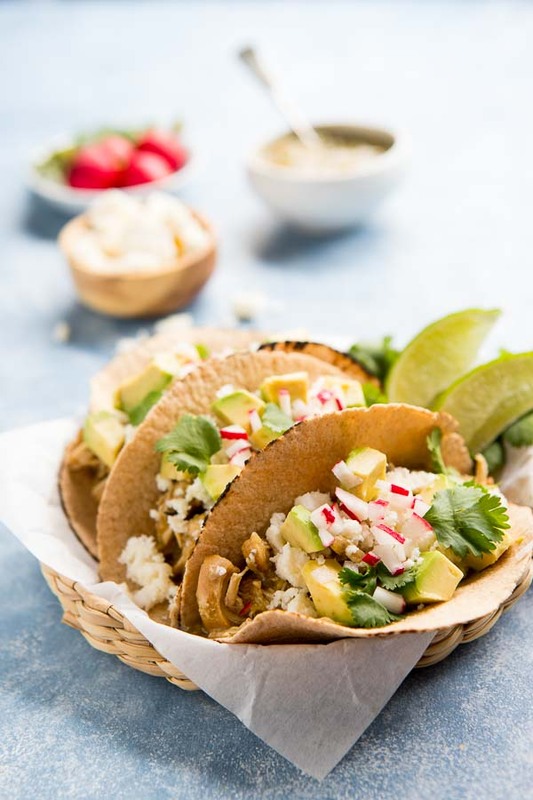 Top each bowl with crumbled queso fresco (or sour cream), diced avocado, finely chopped radishes, and optional sprigs of cilantro. Instant Pot Chicken Chili is an excellent make-ahead recipe. If you find yourself with extra (or if you want to make extra to prepare for future meals), simply store it in an airtight container in the freezer. It’s a great dish to pull out of your freezer on those nights (or days) when you want a healthy meal but don’t have the time or energy to make one. When you’ve tried this Instant Pot Chicken Chili, please don’t forget to let me know how you liked it and rate the recipe in the comments below! 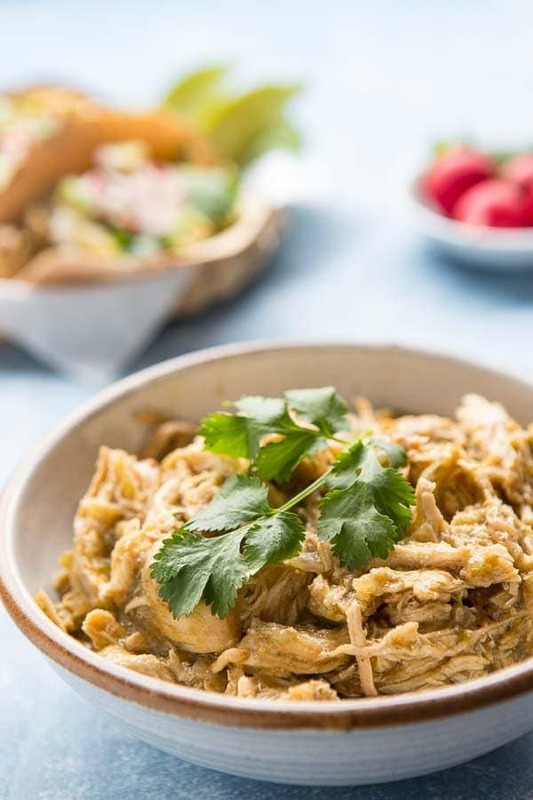 This Instant Pot Chicken Chili is an easy green chili (chile verde) without beans conveniently made in the Instant Pot! Set the Instant Pot to the sauté setting, medium. Add the onion and cook for 3 minutes, stirring frequently until the onion begins to soften. Add the garlic, and stir for another minute. Add the cumin and oregano and stir for another minute. Pour ½ of the salsa verde into the pot. Top with the chicken breasts and pour the remaining salsa verde over the chicken. Place the lid on the Instant Pot and set to “manual”. Set the timer for 10 minutes. Use a natural release (let the Instant Pot release the pressure by itself). Once complete, remove the chicken from the pot and shred the chicken with a fork. Return the chicken to the pot and stir to combine. Serve in a bowl with the toppings or use for tacos. Extra Instant Pot Chicken Chili can be frozen in an airtight container. 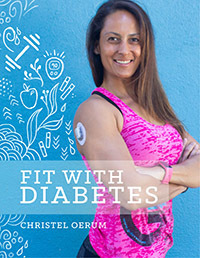 Nancy Buchanan is a Nutrition and Dietetic Technician, registered through the Academy of Nutrition and Dietetics and is on the faculty of Orange Coast College where she teaches courses on culture, food, and nutrition. In addition, Nancy is the owner and author of A Communal Table, an online publication that features ethnic recipes, ingredients, and techniques for curious food lovers who are eager to explore ethnic cuisines. Just wondering, if I doubled this recipe in my 8qt Instant Pot, would I still pressure cook for 10 minutes? Or would I increase that time? Thanks! You shouldn’t have to increase the time, as long as there is still some room left in the Instant Pot (the steam needs room to circulate). If you put more into the pot, it will simply take longer to build pressure before the cooking time starts. What is the actual serving size? Hi Maxine, the recipe makes 8 servings. If you click on the serving size, you can use a slider to adjust it to how many servings you want. Looks so tasty. Thank you for the recipe!